When you are working with a budget, saving on food costs is paramount. One way to lower the cost of your grocery bill is to utilize leftovers from your meals. Keep reading this blog post to find some useful tips for storing leftovers properly. Have you ever heard someone say that a meal, such as spaghetti, tastes even better the next day? Leftovers are one way to save on the rising cost of feeding your family. Cooking a favourite meal? You can use the leftovers for lunch the next day at work or at school. You won’t be able to enjoy your leftovers if they are not stored properly. Proper storage of leftovers prevents food borne illnesses from spoilage. Divide and conquer – If your meal had several components resist the urge to throw them all together into one container. Make sure to take the time to package them separately in the appropriate containers. Don’t wait too long – Leave leftovers sitting for no more than a couple of hours before placing them in the refrigerator or freezer. Also, when using leftovers from the refrigerator, three or four days are often the limit of their safety for further human consumption. Make sure to use your judgment when eating leftovers. Make sure lids are secure – Always use containers that have airtight sealable lids. It is best not to use the pans or dishes that you cooked with because they may allow air and condensation to stay with your food. Have you ever opened a pot and found a layer of water on top of your leftovers? 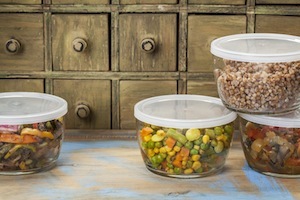 Choose containers and appropriate lids to keep your meals as good as the day they were made. Use serving size portions – If you are freezing a large amount of one thing (say, a leftover casserole), use several storage containers. This allows you to only heat up what you will use without the need to continually reheat excess amounts only to refrigerate it again. It is kind of like making your own homemade TV dinners. Leftovers can help you to avoid waste in your home and save money on your grocery bill. Many foods, such as pasta, taste even better the second time around. Don’t forget, many leftover items can be used to create new dishes for lunch and/or dinner another day/night.